Please peruse this site for various resources and insights on how I use technology in education. As a Visual Arts teacher, I work with images on a daily basis. My goal is to give my students every opportunity to create and communicate using visual imagery to deliver their messages to a global audience. Whether it is traditional methods of using paint and pencil or those that look to the newest trends in technology, the possibilities are endless when you enter my classroom and here are a few of the ways I manage to blend the best of both worlds using various systems of learning. I am a k-12 certified Visual Arts teacher at Byron Center Public Schools. As a graduate from The University of Michigan-Flint and Western Michigan University, I have earned my Masters of Art in Art Education and have been practicing my craft in the Middle School Art room since 2004. My students' work has been featured in SchoolArts Book Magazine and the MACUL Journal. I have been a Cultivating a Calling keynote for ECET2, a keynote presenter for the Art Education Association of Indiana Conference, the Ohio Art Education Association Conference, as well as presenter for the National Art Education Conference, Michigan Art Education Association Conference and Summer PD, the Michigan Association of Computer Users in Learning Conference, as well as local educational institutions. My classroom has won local and national recognition in the Scholastic Art and Writing Awards, awarded various grants, as well as receiving a 2nd place award for the use of educational technology in the 2011 PBS Innovation Awards and first place for the 2013 STEAMed Innovator Awards. 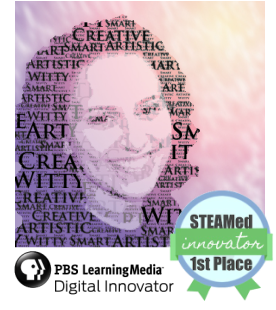 I was also named a 2014 PBS Learning Media Digital Innovator, 2015 Michigan Art Education Association Middle Level Educator of the Year, and 2015 National Art Education Association Western Region Middle Level Educator of the Year. You can find out more information about my classroom on our blog at www.bcwmsart.weebly.com. Interested in one of my presentations? Please contact me if you would like to learn more about the various ways I have used technology in the Visual Arts classroom. I am also available to present to large or small groups.